A year and a half ago I put up a brief post about the Villas – this was really abut the Secret Garden. Here is a full account of the six villas, started in about 1840 and finally demolished in the 1960s. As we have seen the early railway cottages were rudimentary and therefore would not have been deemed suitable for the middle class employees who held management positions with the company. Alfred Blott, the Clerk in Charge of running the Station had to find lodging in Old Wolverton for the first few years and the splendidly-named Brabazon Smyth Stafford, the works accountant, was obliged to accommodate his family in Stony Stratford. Recognizing the need, the L & NWR Board put out a tender for four substantial dwellings and in 1841 Messers Guyther and Company submitted the winning bid and set about constructing four “villas” – this being the fashionable term of the day for up-market housing. The cost to the Board was £393 10s each and they were apparently let for £18 per annum, which appears to be a generous perk for the occupants, given their annual salaries of £150 to £300. Some time after a further two villas were commissioned, more expensive and more commodious, at a cost of £1,045. These were ready for occupancy in 1845. As indicated earlier, the L & NWR assigned numbers to all their properties. In the case of the Villas this numbering has proved useful to research because during their history they acquired a variety of names, and these names were recorded in censuses. In all cases the early names did not stick. In the 1871 Census they are reported as Canal Villa, Woodbine Villa, Myrtle Villa, Primrose Villa, Rose Villa and Henley Cottage. Two of the villas, Numbers 338 and 339, were demolished in the 1880s to make way for paint shop expansion. The approach road to the Station disappeared at the time of the opening of the third station on the loop line known as “Moon’s Folly”, and the four remaining villas were left somewhat isolated from the town until they in turn were demolished in the 1960s. By the 1890s these four had acquired new names. 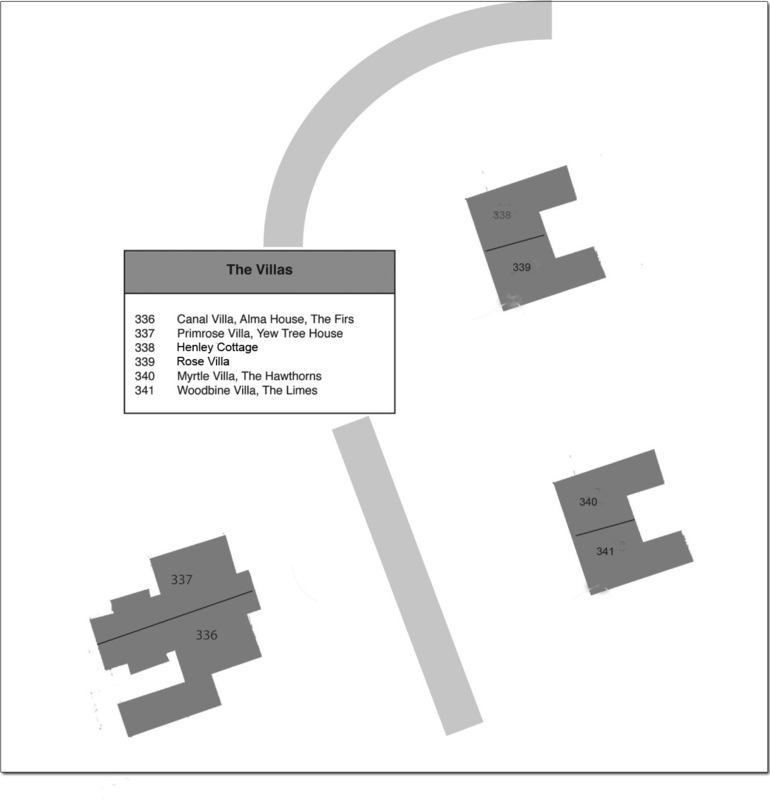 Villa 341 was now The Limes, Villa 340, The Hawthorns, Villa 336 became Yew Tree House, and the large house by the canal side with an attached surgery for the doctor’s use was known as Alma House. In the 20th century this was renamed The Firs. Recruitment cannot have been easy for the new industry. Unknown skills were required so the directors fell back on hiring people that were either known to them or recommended by friends. I suspect that this is how the young Alfred Denny Blott came to this unusual job. He was barely 20 years old when he was given the task of Clerk-in-Charge at the new Wolverton Station, but as with so many jobs in the first days of the railways this was a new job. Nobody had done this task before. There was no experience of running a major railway in the 1830s. The job of station master was one such. The new station would clearly involve monetary transactions and records would need to be maintained so in 1838 this was a job for a man with training and experience in managing records and keeping accounts and they chose the young Alfred Blott. Mr.. Blott was young but the directors obviously thought he would do very well. Early tickets were written out by hand and passengers were required to provide their name, address and date of birth, which may illustrate that our desire to collect useless data is not so recent after all. It took some years to develop more mechanized systems of ticket issuance. The key skill was probably identified as clerical and the title of Station Master only emerged after some years of operation. It is also worth bearing in mind that Wolverton was rated a “First Class” station in 1838 so Mr. Blott must have come with glowing credentials. In fact his preferment to this position is a good illustration of how hiring was done in those days. Mr. Blott’s father, William, was a farmer in Little Stanmore, on land historically owned by the Duke of Chandos and latterly, through marriage, by the Duke of Buckingham and Chandos. I imagine that William Blott had a word with his landlord who was then able to recommend the young Alfred for this new position at Wolverton. In the end, Alfred Blott turned out to be quite competent, although I do not think he was the first choice. This gentleman was G. Kendall who was discharged after a few weeks and Blott took up his position on September 29th 1838, twelve days after the line opened. He lodged in Old Wolverton until he married in 1843 to a Swiss-born wife Cornelia His starting salary was £100 per annum and by 1850 this was £200. I am sure that Mr.. Blott would have stayed there and continued to raise his family in Wolverton. He was doing very well but in 1851 he was at the centre of one of those events that scandalized Victorian Britain – he eloped with a younger woman. The name of this ‘young lady” is not recorded and the affair did not last long for he came back in some disgrace to face up to his discretion. The L & NWR’s Road and Traffic Committee sat in judgement on his case and initially decided to move him. The Manager reported the conduct of Mr. Blott in reference to a late elopement of a young lady from the Wolverton Station – Letters in favour of Mr. Blott were read – also one from himself admitting the truth of the charges against him but stating extenuating circumstances – After full consideration the Committee resolved that Mr.. Blott had been guilty of improper conduct and that it be recommended that he be removed from Wolverton and be sent to Oxford as Station Master and further that he be reprimanded by the Manager. In the meantime there were a number of interventions on Mr. Blott’s behalf from some of the worthies in the community, so the matter was reconsidered. That the notice to Mr. Blott of the directors intention to remove him be withdrawn, and that he be reinstated in his position at Wolverton. So it was finally settled, and it seems that the Company came out of it quite well. They effectively reduced the salary paid to the Wolverton Station Master by £50, replaced an incompetent station master at Oxford with an able one, and removed a stain of social embarrassment from Wolverton. Blott’s wife seems to have stuck by him as she was living with him in the 1861 Census. He only spent a few more years at the Railway before becoming Deputy Treasurer of an Oxford College. He died in 1868 at the relatively early age of 50 and his widow moved to Lewisham to live with her sister near to one of her sons who practised as an accountant. None of his successors was quite as well paid which may indicate that the directors overpaid some of their staff in the early years. His replacement in 1851, Samuel Shakespeare, lasted until July 1854 when he was dismissed. Thomas Davies was brought in from Euston to temporarily assume the duties and Joseph Parker, who had been in the employ of the company since 1838 and had previously worked at Wolverton as a Booking Clerk, came back from Bedford. He spent the remainder of his career, and indeed his life, in Wolverton. He was a single man born in Aston in 1809. A niece, Harriett Parker, came with him as his housekeeper and stayed in that role until her uncle died. When he retired from his job he moved with her into a new house at 23 Stratford Road, the house next to the Presbytery. After his death she moved to Wiillesden where she “lived on her own means” and was able to entertain her own nephews and nieces from various parts of England. On his retirement J. Day, his deputy, held the job temporarily until Edward Odell Bliss, more-or-less local, hailing from Aspley Guise took the posting. He moved into Woodbine Villa with his wife and child and stayed there for about a decade. It is unclear how his career developed from this point. He was replaced in 1890 by Robert Dunleavy who had been Station master at Buckingham for almost ten years. Dunleavy was a second generation railwayman as his father had started with the L & NWR in 1846. Indeed Robert Dunleavy’s sons and grandsons had railway careers taking this line into the fourth generation. This was not uncommon. Hiring in the 19th century was strongly influenced by personal recommendation and what better way to guarantee loyalty than to ensure that sons followed their father’s footsteps. There is a personal association here. Robert Dunleavy arrived with his wife, two younger sons and daughter. The eldest son Arthur had already started work but the two younger boys began work as apprentice clerks in the Carriage Works once they had completed school. One of them was my grandfather and thus began my association with Wolverton. Robert Dunleavy was promoted to Leighton Buzzard in 1895, a position he held until his retirement in 1913. Linslade had a busy branch line to Dunstable and Luton and therefore carried more responsibilty than Wolverton even though by then Wolverton was the much bigger town. As I will note below, Wolverton declined in importance as a railway station over the century and Alfred Blott, the first Station Master, was the highest paid ever. Thomas Brinnard, Dunleavy’s successor took the post into the twentieth century. The six villas were each semi-detached, built in groups of two. Next door to 341, number 340, later known as The Hawthorns was occupied by one of the accountants, William Maddox Pousett. Mr..Pousett was born in 1796 and therefore came to Wolverton as an experienced man. Mr. Pousett’s link to the eighteenth century is yet another reminder of how new the railways were at this time. In the early 1840s speeds of 30mph were still considered to be terrifying. He appears to have seen out his career at Wolverton before retiring to London in September 1863. His place at this address was taken by Alfred Mumford, the Locomotive Superintendent, who probably took up some of McConnell’s duties after his resignation in 1862. After McConnell’s departure, the management of locomotive production was directed from Crewe and eventually moved to this factory in entirety. During his residence the villa was known as Myrtle Villa. A few years later, when Wolverton was completely devoted to Carriage and Wagon manufacture, Mumford was transferred to Rugby to Rugby to continue his line of work. George Fitzsimons, another accountant, moved into the Hawthorns for the rest of the century. Fitzsimons, a bachelor, was highly respected in Wolverton. He served as secretary to the Wolverton Park and Recreation Ground Association, the Savings Bank and the Wolverton Building Society. This Villa, one of the original four, was first occupied by Brabazon Smyth Stafford and his family. As I noted above, they had to live in Stony Stratford until this villa was completed. Stafford was born in Dublin, probably to a middle-class family, and at the age of 30 landed the job of senior accountant at £300 per annum. Next to Edward Bury and J.E. McConnell, this may have made him one of the highest paid men in Wolverton. He raised his family here for almost thirty years before taking a job as auditor for the London and North Western Railway in 1870 and moving to Everton in Liverpool. It appears from a works plan that this villa was enlarged during Stafford’s residence and there are several Board Committee minutes about this matter. It is not clear from reading the minutes whether Stafford bore part of the expense or whether the cost was handled through increased rent. At any rate, when Stafford moved on in 1870 the Villa was deemed to be sufficiently grand for Richard Bore, the Carriage Works Superintendent, when he moved in with his family. Mr.. Bore by this time was in his fifties and he remained there until his retirement in 1886. He was probably the last resident of this villa, which in his time was called Henley Cottage. Richard Bore was a farmer’s son like his contemporary Alfred Blott and may have been typical of many young men of their generation who stepped into the new industrial world from an agricultural background. In Bore’s case he went to Birmingham where he worked at the Saltley works as a coach painter. Along the way he acquired some engineering knowledge, eventually becoming Superintendent of those works. I assume he came to Wolverton when all Carriage manufacture was consolidated at Wolverton in the 1860s. He is known for designing a double railway carriage for Queen Victoria in 1869. It was designed this way because apparently the Queen was very nervous about stepping through the walkway between carriages. Next door lived John Bedford, Superintendent of the Railway Police. The Railway Police in those early days did not have the same function that we would now understand. Their role was more directed towards safety, so they would keep errant passengers off the line, give signals to engine drivers and sometimes switch points. In time these roles became more specialized as pointsmen, signalmen and guards. There were quite a lot of railway Policemen to be found in Wolverton in those early years, which probably reflects the manpower to do the operations I have described. As the decades passed, the introduction of signal boxes, more automated systems and security fencing reduced their importance, and indeed their numbers. The Wolverton detachment for example was under the direct supervision of an Inspector, who was paid £1 15s per week. His constables were variously paid £1 or 19s per week. The pay register reveals various duties. several were based at Wolverton Station, some men were paid to work the witches (points), two were assigned to “Bletchley Gates” and two men each were assigned to 2 ½ mile sections of the track, 46-48½ miles, 48½-51 miles, 51-52½ miles. John Bedford was the senior man, holding responsibility for all police on the line so it therefore made sense for him to reside at Wolverton, at the half-way point. After the London & Birmingham Railway was incorporated into the L & NWR in 1846, policing was rationalised into a London Division and a Birmingham division and Bedford was given charge of the London Division. He did remain in the Wolverton Villa until his family had grown and then moved to a house on Euston Square sometime in the 1860s. Bedford held a job where the ability to manage men was probably critical. Most of his staff were untrained, worked long hours and held the safety of passengers and the public within their responsibility. Even though trains were slow there was little public comprehension of the danger at the time and many of the safeguards had yet to be developed. So in reality the whole responsibility for safety on the line rested upon the shoulders of John Bedford. One has the sense that this Yorkshireman was equal to the task. He was paid £150 per annum for these responsibilities, not a bad wage by any means, but relatively lower than those who had clerical responsibilities. Over his career he had seen considerable change as the business of signaling had become more specialized and passed into the control of others. Passenger and platform safety was under the charge of the Station Master and fences had been erected to keep people and animals off the tracks. He probably had no need to live in Wolverton at the mid-point of the line and he may have undertaken duties which were more appropriate to head office in Euston. No employee of his rank moved into the house which was now called Rose Villa and the next tenant was Robert King, a Foreman in the Carriage Works. He lived there until the house was pulled down, whereupon he moved in with his son who was living on the Stratford Road. These two villas, 338 and 339 were demolished in 1886 when the workshops were enlarged. This event, coupled with the closing of the second station isolated the remaining four villas from the rest of the town. They could only be reached by an approach road from the Stratford Road and were screened from the canal towpath by a high board fence. Many in subsequent generations did not know of their existence. young widows, also a considerable number of men who have lost a finger, hand, arm, or leg. to give us some appreciation of the environment in which the doctor worked. The Company Surgeon was quickly acknowledged as an essential service in this new industrial community and one of the two last villas to be built was assigned his use. This was the building close to the canal. All plans from the 1850s show an attached surgery. I am not sure if this was part of the original construction and it was likely a later addition, but it had the effect of making this the largest house of the six. In the twentieth century the house had a private tennis court in its grounds, probably unique in Wolverton at the time. The first occupant that we know of was William Rogers who hailed from Rolvenden in Kent and had trained as a Surgeon,. and was employed by the Company as such. In 1851 he was only 30, so it is unlikely that he was the first established surgeon but it is probable that he was the first occupant of the villa when it was finished in 1845. When we encounter him in the 1851 Census he is recently widowed with four children under 10. He had two female servants. Subsequently he remarried and for a while moved to Winslow where his second wife’s family came from. He probably set up practice there. In the meantime at least two surgeons took his place. One of them, a Mr.. Jones, appeared to have a hard time of it and may not have lasted very long. In 1855 Jones made representation to the Board for a rent reduction, because he was having difficulty collecting payment from the men. The Board were unsympathetic and it is likely that the poor man who was not hard-nosed enough to ask for payment up-front sought to ply his trade elsewhere. From this petition we do learn that the rental was for this villa was £38 per annum for the house and £12 11 4d per annum for the dispensary. We can also construe that the Surgeon depended entirely upon payment for services for his income and received nothing from the Board, unlike, for example, Crewe, where they paid the surgeon £50 per annum. In 1861 Frederick Webster was the company surgeon but by 1871 William Rogers had returned with a large second family to see out the rest of his career in Wolverton. He was replaced by another young doctor at the start of his career, William Symington. Possibly Symington’s arrival led to the Villa’s name change, for in 1891 it is called Alma House. It retained the same name in 1901 when John Harvey was the surgeon. John Harvey was the last doctor to practice at the Villa because he was able to move to a new house and surgery at the bottom of Green Lane. The house was called The Elms and is still standing. The villa, subsequently known as The Firs, was then rented to senior management employees at the Works. The last of the six villas was built next door and was also one of the last two to be built. It was known as Primrose Villa for a time and then was re-named Yew Tree House, which name it retained until its demolition in the 1960s. The house appeared to be reserved for senior engineers. In 1851 the occupant was Thomas Forsyth and his family. He was described as a Practical Engineer and Assistant Locomotive Superintendent – in other words second-in-command to James Edward McConnell. He was probably not the first occupant of this villa, for his predecessor, Frederick Parker, had been at Wolverton since 1840. In 1848 he was unwise enough to tell a Board of Trade enquiry the truth about the failings of replacements for footplate men during a strike. The Board were unhappy with his version and expressed their displeasure by giving him the sack. Forsyth was then 32 and his wife Hannah 29 with four children under 10. His 17 year-old younger brother Alexander was also living with them, he an apprentice engineer. They record two house servants, an 80 year-old widow born in Worcestershire and an 18 year-old local girl, Maria Jarvis. I suspect that Martha Field, the widow, may have had some family connection and that the young Maria did most of the hard work. Forsyth left in 1854 to work for a Manchester engineering firm where tragically he lost his life in 1858 due to an exploding boiler. His successor was William Rowland, who had been working in Wolverton for some time and had previously lived with his family in one of the Young Street Cottages. He may have been moving up in status and the irony of raising a large family in a two bedroom cottage and moving to a substantial three bedroom villa when the children had left home may not have been lost on him. By 1856 he was paid a salary of £300 p.a. – probably double his earnings while living in Young Street. This highlights the general shortage of better quality housing for those of middle to upper incomes during this period. Only these six houses, six at the end of Bury Street, the Schoolmaster’s house and the Vicarage were distinct from the one and two bedroom housing for the workers – only 5% of the total housing stock. Rowland saw out his career in Wolverton but died in 1870 before he reached his 60th birthday. His widow Maria returned to Derbyshire with her family. The new occupants in 1871, were the Charles Davies family. Davies was at this time a Foreman in his mid-fifties with only his younger children still at home. These were transitional years for Wolverton works and increasingly the houses were occupied by carriage people as the locomotive engineering and repair was transferred to Crew. The next recorded occupant was William Panter, only 40 years old in 1881, and Manager of the Carriage Works. He was second-in-command to Richard Bore, the Superintendent. Richard Bore took on the design and engineering responsibilities and his manager, Panter in this case, saw to it that his wishes were executed. Panter, born in Castlethorpe in 1841, was a child of the railway age. His father, Barnabas, was an Engine Driver, and the young William grew up in a small two bedroom cottage on Creed Street. He first apprenticed as an Engine Fitter in 1853 and then worked his way up through the organization. He became a Foreman in his early thirties and in December 1877 was promoted to his managerial role at a salary of £250 per annum. He was something of a high flyer and followed a similar trajectory to his mentor Richard Bore who himself started his working life as a coach painter in the Saltley works. It is possible that he could have succeeded Bore at Wolverton but the opportunity came in 1885 to become Superintendent of Carriage building for the London & South Western Railway at Nine Elms and since the Board had already made its decision to build the new railway workshops at Eastleigh, it is probable that Panter was chosen for the position with this in mind. He was therefore influential in designing the new works at Eastleigh which opened in 1890 and transformed that village much as the railway had transformed Wolverton at the time of William Panter’s birth. He was able to bring almost 40 years experience of rolling stock manufacture to his new position which meant that the Eastleigh works could be developed at a stroke on 41 acres of land, whereas the Wolverton experience had been piecemeal development, experiment and modification. He was noted for producing tri-composite carriages which were a feature of certain holiday routes on the L&SWR. These carriages were built without corridors but with separate entrances for first, second and third class passengers. Panter is certainly remembered as a significant figure in the London and South Western Railway and in the civic life of Eastleigh where he served as Chairman of the Urban District Council for a number of years. One of his sons, Albert Henry Panter, had an equally successful career as Works Manager for the London Brighton and South Coast railway. William Panter was by no means the only success story to come out of Wolverton, but he was one of the first, and he is an illustration of how a man could start from humble origins in a crowded cottage in Creed Street and make his way in the Victorian world. The rental for this villa was set at £24 in 1848. Parker had lived rent-free but Forsyth was to be charge. The rent appears to be set between the £18 charged for the first villas, and the surgeon’s residence next door. 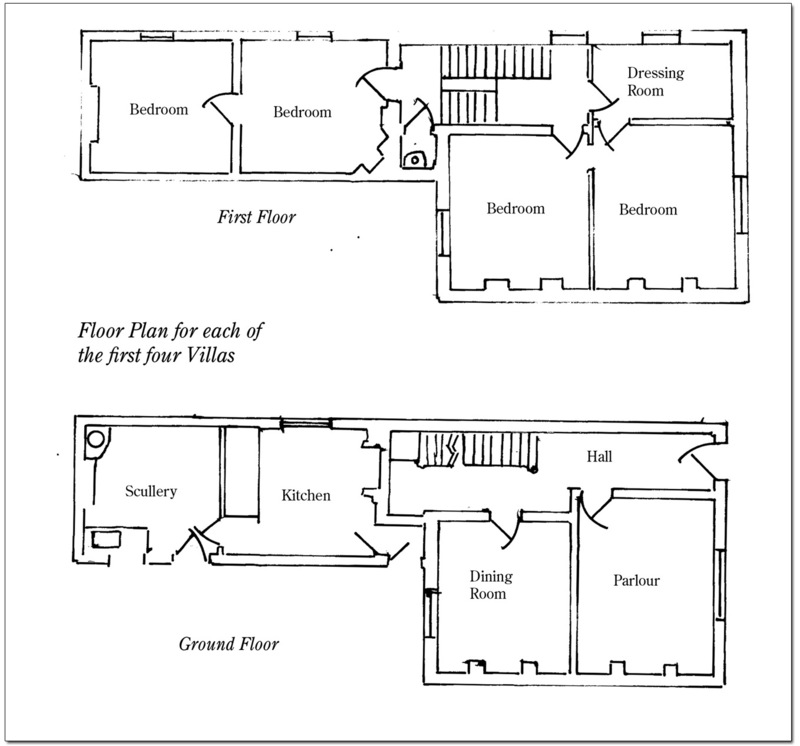 The plan drawings here are from drawings produced for the Wolverton Society for Arts and Heritage and show the layout for the four original villas with the later addition of a W.C. and copper boiler. As can be seen from these drawings the living accommodation was more in keeping with the generality of Victorian middle class housing. The Parlour was the reception room, which together with the Dining Room constituted the two public rooms of the house. The hall and passageway led to the kitchen and scullery and to the stairs. The kitchen was designed for food preparation while the scullery, often a step down at ground level, served for washing and cleaning. There are four bedrooms and once running water had been provided later in the century, one of these probably was converted to a bathroom. This is the view to the entrance of Villa 341, later known as The Limes. In the background you can see the level of the Stratford Road, which indicates how tucked away these Villas were from the rest of the community. The shell of the former workshops of 1845 is visible. The other pair of original villas lay to the left of the picture where the new workshops now stand, and the last two were located to the rear of this viewpoint. A few years ago there was an imaginative reclamation of part of the land where these villas once allowed their residents to live in nineteenth century middle class comfort. After the houses were demolished in the 1960s the land was derelict. The Wolverton Society for Arts and Heritage took up the challenge and secured funding in 2003. 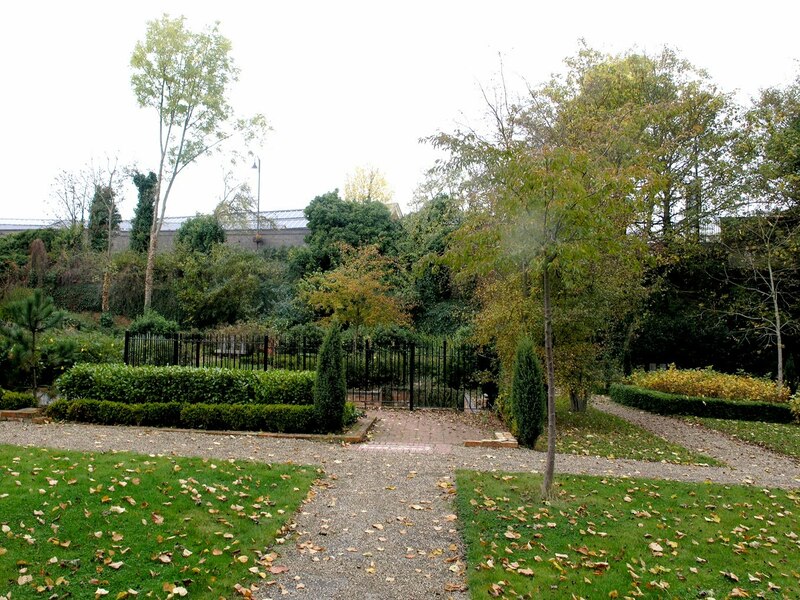 Then through a combination of professional archaeologists, landscape designers and volunteer help from schools and adult members of the community were able to create what is now called The Secret Garden. The garden is designed around two of the villas (Numbers 340 and 341) and the ground floor rooms are marked out with mosaics. The cellar of one of the buildings has been excavated and is protected by iron railings. The outcome is a very pleasant and creative connection with our past. RAIL 410/148 Minute 5735 Road and Traffic Committee. Minute 5833 Road and Traffic Committee. F.B. Head. Stokers and Pokers. John Murray, 1849. p. 82. Jack, Harry. Locomotives of the LNWR Southern Division. RCTS, 2001. P. 30. Tucked away, down a narrow approach road just across the railway and canal bridges, were four Victorian houses – twos sets of semi-detached houses. In the 50s they carried the names of The Hawthorns, The Limes, Yew Tree Villa and The Firs. I delivered newspapers there in the 1950s; otherwise I don’t expect I would have had any reason to go there. These four dwellings were almost completely separated from the rest of the town apart from the aforementioned approach road. At the time they were built (there were six originally) their placement mad perfect sense. The original railway line followed a straight line through Wolverton to the west of its present curve and the second station was located here to the south of the Stratford Road. The Villas (including the Station Master’s house) were then on the approach road to the Station. Sir Richard Moon’s later decision to by-pass the town with a new line (Moon’s folly) led to the demolition of the station and two of the villas, leaving the remaining four isolated. I didn’t know this at the time (or if I did, I was not sufficiently interested) but my great-grandfather Robert Dunleavy lived with his family at The Limes from 1890 to 1895, when he transferred to Leighton Buzzard. One of his sons and a daughter lived into their 90s and it is a pity, in retrospect, that I did not know the questions to ask. Robert Dunleavy came to Wolverton from Buckingham, where he had been Station Master for a decade. His eldest son Arthur had already left home to work for the L&NWR in Goods, but the two middle boys, Herbert and my grandfather Harold, both reached the age of 14 in Wolverton and began work as apprentice clerks in the Carriage and Wagon Works. Both spent their careers there. In 1895 Robert Dunleavy transferred to Leighton Buzzard, which had more traffic because of the branch line to Luton and therefore paid better. The villas were demolished in the 60s at the same time as the little streets were levelled.